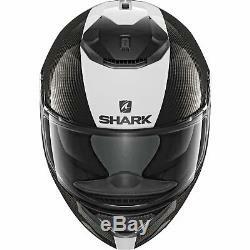 HE5000EDWSXL - Shark Spartan Carbon Skin Mat Motorcycle Helmet XL White (DWS). The Shark Spartan Carbon Skin Motorcycle Helmet is part of the latest Shark Collection. A classy fiber helmet with an elegant streamlined look and optimized air flows. Like the Race-R PRO, this model was developed using CFD (in simulating computational fluids). Its design has been entirely dictated by the desired functionalities: each line of the helmet is assigned a precise function, and its location on the shell is determined to guarantee optimal aerodynamics. PLEASE NOTE: This helmet comes with a clear visor fitted as standard. The UK's No 1 Motorcycle & Motorcross Accessories Store. View All Parts & Spares. Helmets > Full Face Helmets. In Stock Available for Dispatch Today. This helmet comes with a clear visor fitted as standard. From safety, via innovation, quality, design and racing, SHARK manufactures high performance helmets. Since the creation of SHARK, we make it a point of honor to increase safety in our products. Our R&D office pushes research limits above the usual to reach the best possible performance. Designed with the latest software and tools, our helmets benefit from modern innovations. The Shark Spartan Carbon Skin Full Face Bike Helmet is packed with features.. Shell Construction - Carbon aramid fibre and multiaxial glass fibre. 2 Shell Sizes - Optimal morphological adjustment. "SHARK SKIN" Cover - Active reduction of whistling noise. Double Spoiler with Incorporated Air Extractors - Provide optimization of the aerodynamic trail and internal cooling. Pinlocl MaxVision Visor - Anti-scratch, can be fitted with a Pinlock MaxVision film insert. Integrated Sun Visor - UV protection, anti-scratch. Fastening System - Double D-ring chin strap. Removable and Washable Interior - For ease of cleaning. Use the delicate or cold cycle and place inside a washing net. Glasses Groove - Optimal comfort for the persons wearing glasses. SHARKTOOTH Prepared - The helmet has been designed to accommodate the Sharktooth Bluetooth Intercom. UNECE R 22-05 - Europe. Your package will include the following. 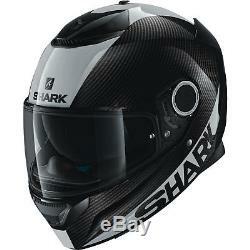 Shark Spartan Carbon Skin Motorcycle Helmet. Please use the conversion table below to determine the right size for you. This product has no reviews yet, however see what our buyers say about our other products.. To maintain our service we only select the market leading couriers to deliver our orders. Same Day Dispatch, Monday - Friday. A select few items may have a longer lead time as they may be specially ordered from our manufacturers. From July 1st 2017, UK Good Deals Ltd can accept orders from most countries. RETURNING A PARCEL FROM WITHIN THE UNITED KINGDOM. When an item is Faulty. If you item is faulty, you may qualify for a pre-paid label, please contact our customer service team before you return your item for the best way to proceed. If you do not qualify for a free return you can simply send the item back to us via your preferred method, however we do recommend you use a traceable service so that you can track your items. The CollectPlus Service is a quick and easy way to return your item. As an International customer, you can return your parcel using any postal service. Once the item arrives back at our warehouse, a member of our customer service team will contact you within 24hrs to discuss the return. The item "Shark Spartan Carbon Skin Mat Motorcycle Helmet XL White Sun Visor Pinlock ECE" is in sale since Monday, December 24, 2018. This item is in the category "Vehicle Parts & Accessories\Clothing, Helmets & Protection\Helmets & Headwear\Helmets". The seller is "ghostbikes_uk" and is located in Preston.